North Star puts on great national act shows regularly in there new 700 seat entertainment facility. I was there to enjoy the legend Willie Nelson as well as a unique artist named Bill Miller. What A show! Before I get to Willie and Bill, I think it is important to inform you about the entertainment complex itself. The stage stretches across the entire width of the structure giving every seat full view. The ceilings are very high which may account for the great ventilation. Nice and airy! The seats are placed a nice distance from each other for comfort. While we are on comfort, lets talk temperature, it was perfect, not an easy accomplishment when putting 700 people in one room. I was surprised that I never felt crowded. Coffee, pop, beer and cocktails were served near the main entrance but most everyone remained seated during the performance. Security is generally an issue with me especially since I'm usually lugging around camera equipment, laptop and anything I might possibly find some use for. I really did check out the security officers while they gently moved about keeping an eye on things, I honestly liked what I saw. Another feather in North Star's Cap, Well Done Guys and Gals! I would like to share a little experience I had while standing outside by the entrance, concerning a touchy security and guest situation. A young woman decides to bring her audio video camera into the concert. Audio equipment is absolutely not allowed! She decides to insist, nicely of course, but insist she does. The whole situation could have been handled in many ways, North Star uses politeness and humor to aid in regulating the rules. It was quite funny really, she sure thought so. It ended with another employee running up stairs to retrieve a disposable camera for her. Now that's service! And now on to Willie Nelson. He was everything I expected. He looked great in his own hippy way. His voice was clear and wow did he sound great. Willie has been around for what seems like forever but he still sounds like a thirty year old. His audience loves him and cheers him on. Willie throws his hats and scarves to the audience, they go nuts. He looks people right into their eyes, as if to say, "Hey, it's good to see you also." I even got a wink from him, I did the ol' look behind myself to see who was behind me, nope it was for me. He sings all the old favorites, easing us all back more than a few years. 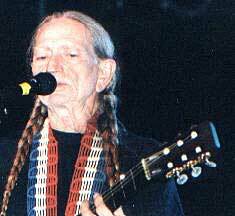 Willie sings and smiles the night away. Copyright 2000 Bill Miller has a unique style all of his own. Bill comes from the Stockbridge Munsee in Wisconsin, his music has been influenced by Jimi Hendrix, Neil Young, and Bob Dylan. I have never heard anything like it. I was mesmerized the entire time he was on stage. It was all I could do to tear myself out of my chair to accomplish what I was there to do. Everything he touched seems to turn into an instrument, his guitar doubles as a drum, he plays two wooden flutes at the same time, harmonica and sings directly into your soul. 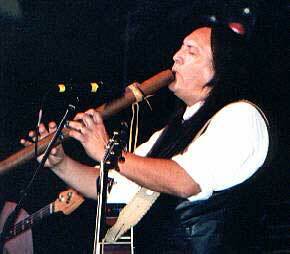 Bill Miller is the epitome of masculinity on stage with his clear Native American good looks, long black hair and intense dark eyes. Bill Miller's style is clearly one of a kind. My companion who is a musician himself was awed by Bill's guitar style. A rock sound a little bit of blues and a truck load of spirituality got dumped into the hearts of the audience. Sorry Willie, Bill stole your show and put a lump in our throats that is in here to stay. He sings about pride, child abuse, drugs and alcohol and reaching above all of it. 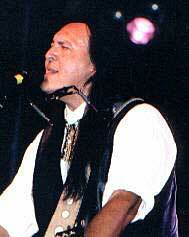 He reminds us of family bonds and encourages us all to never give up, he certainly never did, he has won five Native American Music Awards including the Best Male Artist and Songwriter of the year, one for the song Ghost Dance. Both my companion and I agreed our favorite song was Reservation Road. Bill talks to his audience candidly and is well received. He tells us he doesn't see himself as a Native American, he believes we are all Native Americans, then he says he is just an Indian Guy. The audience is mixed with agreement and laughter then... brief silence. If you have ever known prejudice or unjust behavior, if you were ever a victim in any way, you spent this brief silence giving it some thought. Somehow, Bill manages to turn this into a positive experience and sends us a powerful message, I sure got it, we are who we are and treating each other like brothers will make this earth a much better place to be.